Me ship was sailing through a canal that I was familiar with. In fact, I remember seeing a crazy Chinese guy dressed up as a Mexican carnival singer and yelling random Spanish phrases the last time I was here. I spotted the place where he stood at but it was conspicuous by his absence. My curiosity got the better of me and I decided to dock here once again for another meal at Loco Chino. When I entered this little restaurant, I saw the guy with an even more flamboyant Mexican attire. And he was eating Sushi. I think the sea has some strange sights. 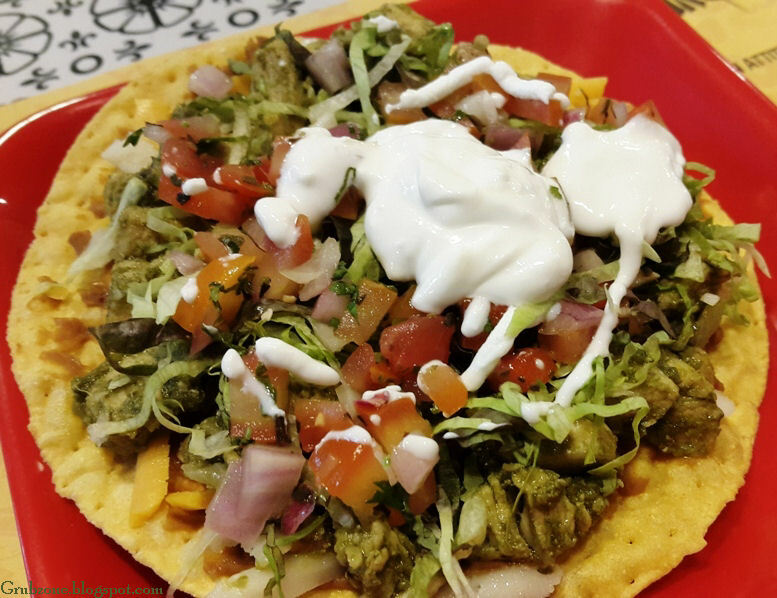 Loco Chino has added a few new items to their existing menu. This included more signature dimsums, Tostadas and even some Sushi options. I was sent a request by their PR to come sample their new grub. Since I had intended to travel to Fort for the colorful Kala Ghoda arts festival, I thought that I would combine the two trips. Lunch at Locos and then a long walk at the festival. Sea food dimsum tasted like a mixture of minced crab and shrimp meat packed in a soft cover. It was styled like a chilli on the plate though the spice content was not high. Clockwise from Top right, this dim sum platter had Burnt Garlic Basil Chicken, Roasted chicken, Lemon Grass Chicken and Spicy black pepper chicken dim sums. 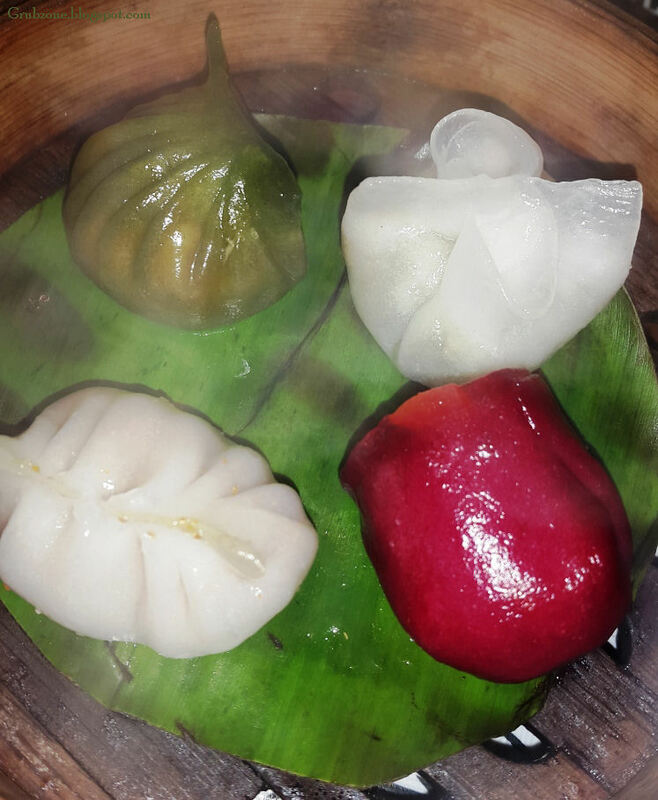 The colored dim sums tasted really great. 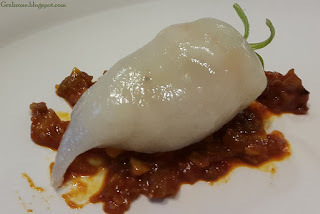 The red colored roasted Chicken dim sum had a soft filling inside. The chicken was mildly spiced and sprinkled with herbs. The green colored black pepper chicken was a great package. The soft green wrapper and the melt in mouth pepper chicken were quite divine. Captain : Red Mine. Green Mine. Crewmate : Yay, I get the other two right? Captain : Nina, look I saved you two white dim sums. 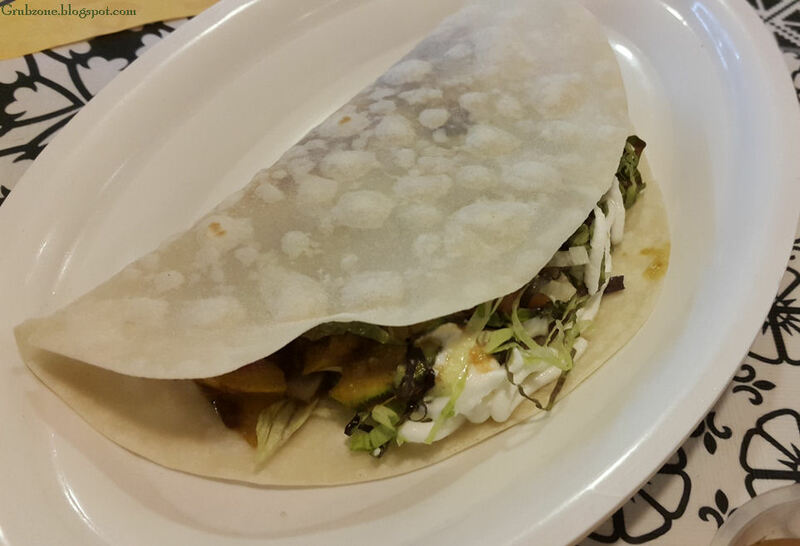 Vegetarian Taco is not a part of their new menu but its something that experiences a different variation every day. So it would be fair to say that this item is reborn every day. This soft Taco had a rich filling of greens, beans and spicy sauces inside. It was quite appealing even to a carnivore like the Captain. It is easily superior to the likes that are served at food court installations. 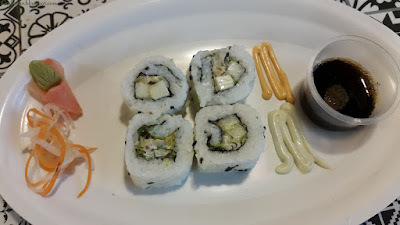 California Rolls were a surprise addition to the menu. One doesn't expect Japanese in a Chinese-Spanish place but Sushi is really catching on to the general restaurant eating populace these days. And while I am not particularly fond of Makizushi(I prefer my sea weed outside), Loco Chino's creation was a decent work. The obvious improvements would be a better sushi rice, better aesthetics and perhaps more meat in the sushi to impart that typical umame. More wasabi would be welcome too. 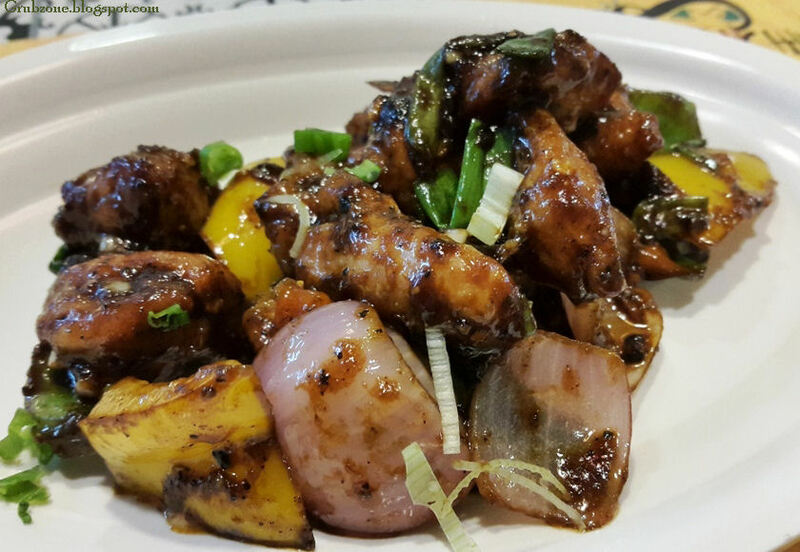 Black pepper Chicken was actually a part of their old menu. However, I was told that they added some new variations to it thus making it part of their new menu. I am no culinary expert so I could not track the said variations. But I still enjoyed Black pepper chicken just the same, it is after all one of me favorite dishes. Chicken Serrano Tostada was a perfect emulation of the Spanish snack. Well cooked juicy serrano chicken was topped with pico de gallo and sour cream. The only glitch in this item was the lower spice content. If one is using serrano peppers, the spice content has to be sporting. Not much has changed as far as service or ambiance is concerned. One can find elaborate discussions on these topics in my previous post on this place. The pricing is again easy on the pocket. Of the things that I tried, I found the dim sums and dumplings quite good. 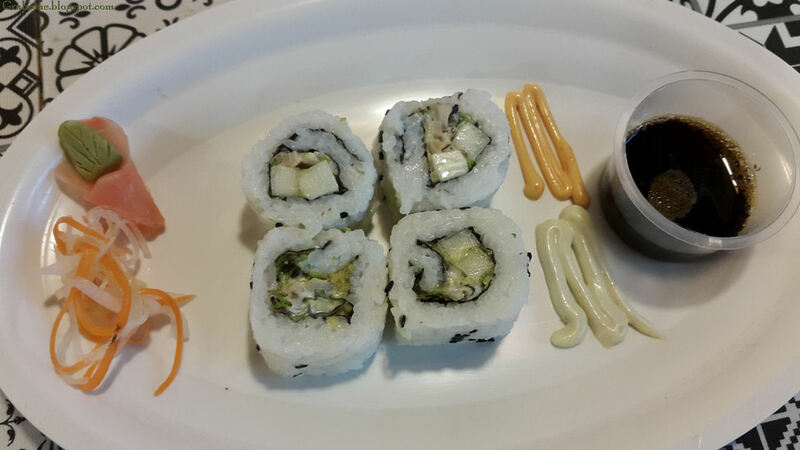 The Sushi could use a bit of work and Tostadas more spice. Meal done, time to head out to the arts festival. "I am so glad that I found the strange multicultural bloke. It would be a shame to pass this canal without seeing his colorful antics. Now lads, full speed ahead - We have a busy day in the oceans ahead. "